Fantastic news coming from the camp of Brooklyn’s dark, grunge-tinged heavy rock powerhouse, KINGS DESTROY, today. The quintet will release their new full-length studio album – the first in four years, ‘Fantasma Nera‘, on March 8th via Svart Records. Though at this time the details connected to the upcoming offering are limited, we do have the album’s artwork and track list being revealed here, along with another item or two. 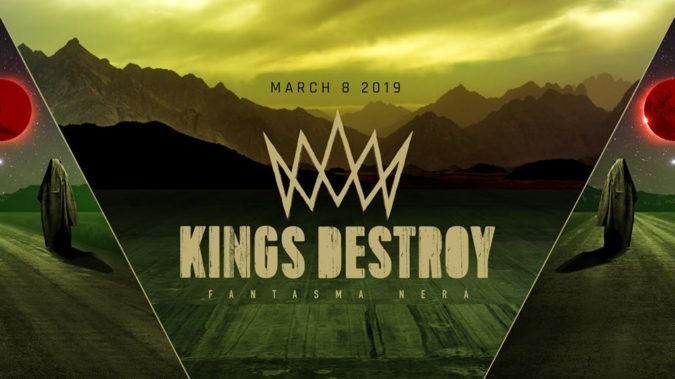 ‘Fantasma Nera‘ was produced by Dave Bottrill and that fact alone is plenty to fuel expectations that the album will likely be a major milestone outing for KINGS DESTROY. Bottrill’s work with such acts as Tool, King Crimson, I Mother Earth, Coheed And Cambria, Soen, Stone Sour, and many others, has established him as someone that gets dynamic results from the artists he works with. Pre-order for ‘Fantasma Nera‘ will be announced soon, along with North American tour dates. KINGS DESTROY recently confirmed that they will be performing at this year’s edition of the world-famous Maryland Doom Fest (sponsored in part by Riff Relevant) held from June 20th – 23rd in Frederick, MD. For more info, ticket / pass purchases, and other details on the Maryland Doom Fest, visit this LINK.